At E3 I got my hands on yet another dungeon crawler that I've been looking forward to playing. 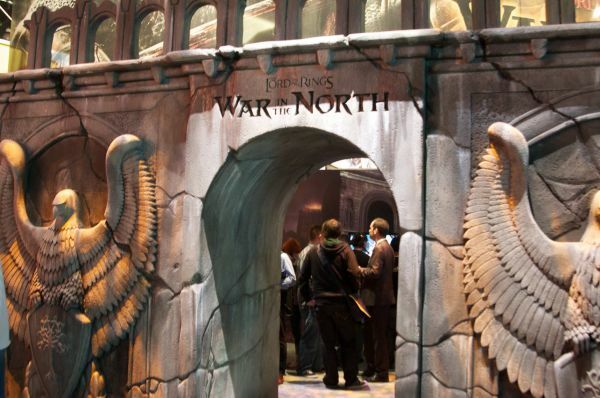 The Lord of the Rings: War in the North features one of our favorite co-op modes: split-screen with online play. The demo I played didn't have any split screen, but I was able to confirm with the rep that two couch co-op players could join a cross town (or cross country) buddy for some LOTR goodness. And if there's only two of you? Then the AI will take the controls of one of the three classes. LOTR: WITN is a class restricted game. You can't have three elves, or three dwarves, or two elves and a ranger mix and match. The game only allows one of each class into a game session. This may irk a few potential players, but each class seemed to be able to fulfill different rolls. As I talked with the rep the other two players chose their characters. I was left with the elf. Damn. I grabbed a controller and dove in. The first thing I noticed was the speed of the the game, or the lack thereof. As an elf I expected to flip and zip around the battlefield, sniping foes with a bow and using elf-jitsu on larger opponents. Instead, I hacked and slashed like a warrior, occasionally blasting fool orcs with my staff-cannon. It was okay, but I felt a little bogged down. If I was controlling a dwarf or human I don't think I would have had this problem. The next thing I noticed was the violence. The sweet, sweet violence. This game will have no problem getting a Mature rating. I hacked orcs to pieces with ease. The blood is very dark and almost looks black at times, which makes me wonder if they'll have a content filter. Since I was trying to talk to the gentleman demoing the game and play at the same time, I missed out on the mission goal. "Kill up all the stuff that isn't you or you're team" seemed to be a pretty good strategy. None of us were playing a class roll. We weren't really supporting each other with buffs or heals, but we were destroying our foes and moving forward, which is all you need if it's fun. I was told items and XP stay with your character. You won't be a placeholder for another gamer's AI. Loot is classed-based, so there won't be any arguing over drops since only one of each class can be in a play session. I was about to ask about the skill trees when a GIANT EAGLE dropped from the sky and absolutely destroyed an orc. 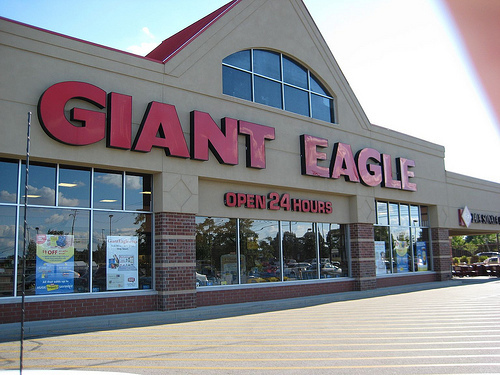 And I'm not talking about a mid-western grocery store, I'm talking about a giant talking eagle. Although, dropping one of these on somebody would be pretty damn boss. Okay, the bird is cooler. 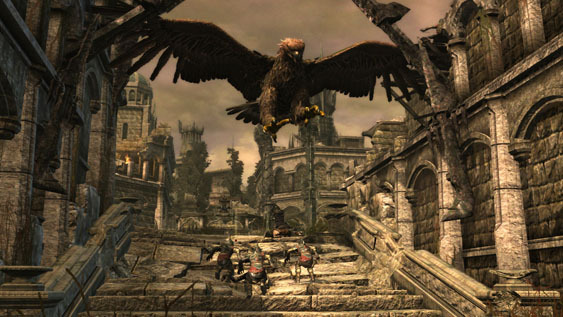 As much fun as it was watching the eagle go to town on the orc, there was business to attend to. Some trolls had arrived, and they were really wrecking up the place. My turn. I pushed a button and winged death dropped from the sky. The giant eagle tore up the troll like it was hiding some sort of giant eagle snacks in its pockets. Obviously, this looked cool as hell. It really reminded me of scenes from the movies. I asked if there were going to be other weapons like this in the game. Unfortunately, it doesn't appear to be so. Summoning the different forces of Middle-Earth to aid you in battle could have really made this game stand out from other similar action RPGs. Overall the game played well, but I just wish it was a little faster. Maybe I just had problems with my plodding elf character. A lot of the powers, including the eagle attack, were on a cool-down timer. This slowed the pace of the game, and led us to simply hacking our way through everything instead of using our powers. Still, LOTR: WITN has something that so many games don't, split screen with online co-op support. We'll find out what else Snowblind studios has in store for us when the game releases on the Xbox 360, PlayStation 3, and PC on August 24.